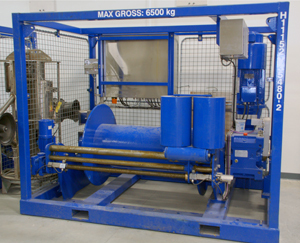 The UNOLS East Coast Winch Pool was developed to facilitate the science based use of winches. The East Coast Winch Pool is part of the UNOLS Equipment Pool Program. We maintain, prepare, and repair portable winches used in the fleet. The majority of our funding comes from the National Science Foundation. 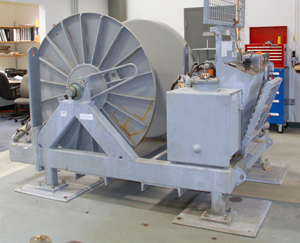 These winches are large and are for large diameter cables. They are multiple pieces. These winches are relatively large and are best suited for larger diameter cables or very long lengths of smaller cable. They are capable of holding 2000 meters of 0.5 inch cable. They can be used with a motion reference unit and have active heave compensation. They are also capable of operating with render and render recover modes. These multipurpose winches are best suited to small diameter cables. They can level wind any diameter cable and are suitable for most applications. For example, they are capable of holding 2000 meters of 0.322 cable. 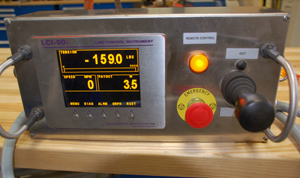 They can be used with a motion reference unit and have active heave compensation. They are also capable of operating with render and render recover modes. These winches are the smallest least powerful winches available. They are used for light loads. These winches are used in mooring operations. The East Coast Winch Pool has standard base plates and turntables for the winches. Wire spoolers are used to spool cable onto winches. Contact the WHOI Port Office for scheduling. Use the schedule request form, or call the winch pool. ©Woods Hole Oceanographic Institution. All rights reserved.